I've been meaning to make this improved version for a while now; the ZX Spectrum BASIC Game Jam provided the motivation. You can play the game online courtesy of the JSSpeccy emulator. BASIC source code is included in the snapshot; just end the game when prompted to, and list it. Use as you wish, and enjoy! Simple game but could be fun, if the questions were a little less confusing. For example, it's not very clear what "How much grain should we pay workers in?" means. Is that "what's the total amount that we should give to the workers (and that'll get divided between them all)", or "how much should we pay each individual worker"? And it doesn't seem to be very obvious how that affects people coming and going in the next iteration; I had 50 workers and paid them 300 grain, and the next iteration had about the same number arrive and leave (so I still had roughly 50). The net iteration I paid 400 (a 33% pay rise; not bad in anyone's book, that) and then more people left than joined, so I had fewer workers. I agree there should probably be some randomness, but this is not how the world works, with economics as it's currently designed. 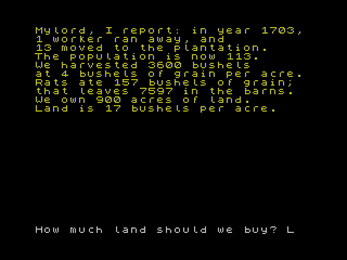 Another example: it seems that each person can seed a certain amount of land, but it doesn't tell you how much that is. if you've got 55 people and try to seed 1000 acres it says no ("but you only have 55 people! "), but you can do 500. 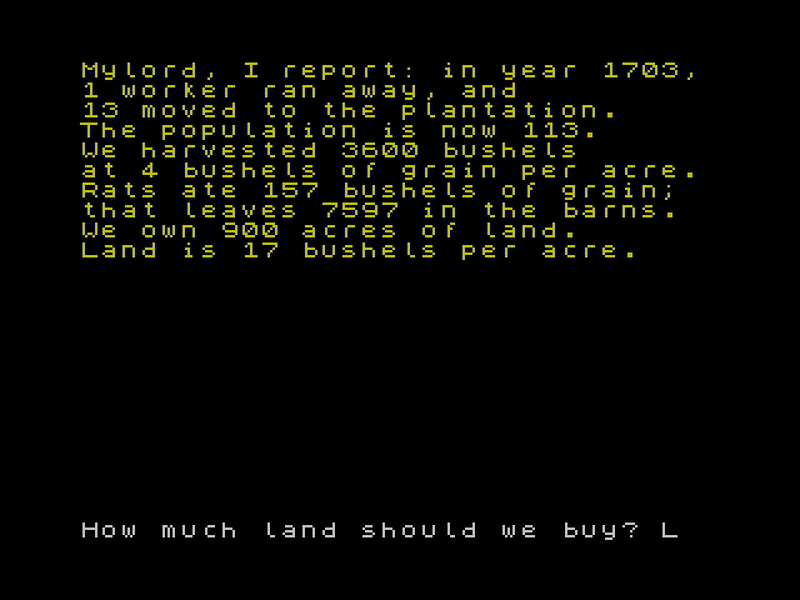 Does this mean that each person can seed 10 acres? I don't know; maybe I'm supposed to deduce this from context, but that's not an interesting puzzle, it's just annoying. Kudos for sorting out the formatting so that words are not broken across lines. Hi there, and thanks for the feedback! You're right, that question is poorly phrased, but I have little room to work with. If you can suggest a more clear formulation that fits in the same amount of space, I'd be grateful. Other messages I was able to compress better -- and thanks for noticing, that was a big part of the porting process. This one question was more stubborn. As for the rules, most of them are vanilla Hamurabi, including those for immigration. I don't think it was ever supposed to be realistic -- just entertaining. For what it's worth, workers want 20 grain apiece in order to stay; keep in mind, that's pay for a whole year. How much they can each seed, you guessed without any help, so that part works well IMO.